This high speed overview will help you make a more informed choice when deciding on an exterior door. This door structure is by far the most common design. It’s a very flexible design allowing for variations of a frame with panel inserts. The basic idea is to frame a ‘floating’ panel within a sturdy frame. The panel inserts often use glass (French doors), solid boards or planks. One of the main reasons for the popularity of these designs has little to do with aesthetics. Wood planks move the most across the grain – the wider the plank, the more the movement. Using narrower planks reduces the amount of movement. Another reason, is that most timbers are not that stable across the width. Often, when one looks at longer planks, you’ll see how some of the planks twist and buckle. Keeping the planks narrower helps overcome this problem. This type of door is a stronger variation of the ledge and brace door (below). The door consists of a solid timber frame, faced with Tongue and Grooved planks. Often the design will include a diagonal brace to add to the strength of the door. This design is often used for kitchen or “back” doors. This design is used in many modern doors. They are the cheapest to construct and have the lowest raw material cost. As a result, most interior doors, are flush doors. These doors are essentially a solid timber frame (stile and rail) with an outer skin. 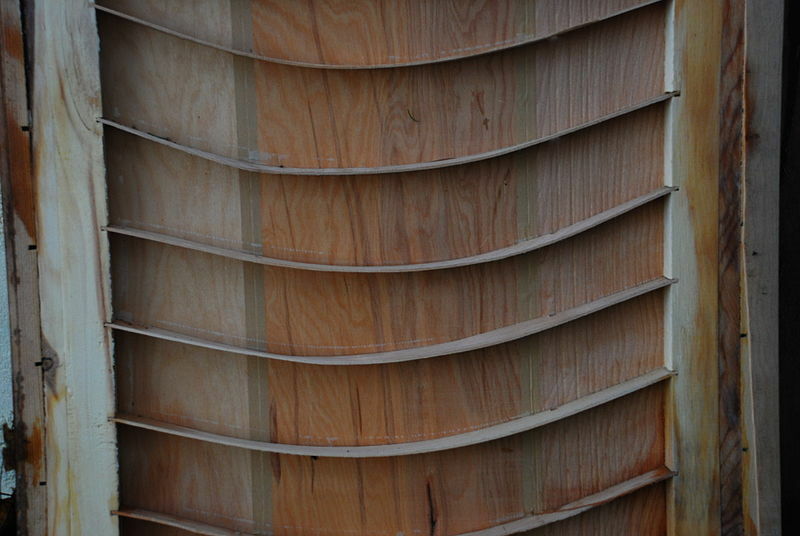 The outer skin is usually a wood veneer, thin plywood, MDF or Masonite®. Often the MDF or Masonite® skin has a pattern pressed into it to add a bit of texture. The skins are most often painted to hide their appearance. Typically, these doors are hollow, but there are designs where the hollow core is supported with a lattice or honeycomb made of corrugated cardboard, or thin wooden slats as seen in the picture on the right. Most flush doors are not suitable for anything but the most basic security requirements.